Will your child only nap in your arms, in a swing, or after elaborate rituals? Does your child take cat naps--or none at all? Let world-renowned, trusted parenting author Elizabeth Pantley help you. She'll guide you with the same sensitive expertise and gentle approach used in her other No-Cry bestsellers. Research shows that naps improve health, mood, growth, and well-being. Yet children often resist the naps they need. The results are fussy, crying babies and cranky, grouchy kids who also have trouble sleeping at night! In The No-Cry Nap Solution Pantley explains to parents of children ages newborn to kindergarten the importance of napping to both behavior during the day and sleeping during (and through!) the night. She then shares with you her gentle, loving techniques--tested on families of all sizes and circumstances--and shows you how you can customize her solutions for your own family. Pantley addresses issues such as children who resist naps, dealing with schedule changes, turning short naps into longer ones, helping a child go from needing motion to sleep to "stationery" sleep, nursing at naptime, solving daycare napping problems, and more. First of all I must say that I LOVE Elizabeth Pantley's books/methods. I have read several of her books and they have all helped me more than I could possibly say. The no-cry nap solution is brilliant. I love that Pantley is not pushy about her ideas. She often says that each family needs to decide what works for them... no guilt, no making you feel like an incompetent inadequate parent. Just wonderful helpful advice and ideas to make your life a little easier... and more restful! Personally I could never handle the cry-it-out method so the no-cry solutions were absolutely perfect for me. When Aiden was a new baby he was colicky... horribly horrendously colicky. He cried a good 8-10 hours per day, every day for 5 months straight. Even then he cried a good 5 hours per day until he was about a year old. I thought I was going to die from lack of sleep. When Aiden was about 8 months old I was desperate for some sleep. Several of my friends and a pediatrician told me to let him cry it out. So I tried. We did it for 4 nights in a row. He would scream until he would puke all over himself and his bed. I would change the sheets and try all over again. He would scream til he was practically asleep standing up holding the crib rail then he would fall down and hit his head/arm/foot on the crib and start all over again. I spent the night weeping outside his door, feeling horribly guilty. I gave up after 4 nights of torture for ALL of us. 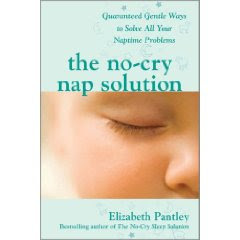 I found a copy of the no-cry Sleep Solution somewhere (library? store? no idea) and picked it up. Read it front to back. Immediately started with her plan. 3 weeks later Aiden was going to sleep no problem AND having good naps. He was still a VERY high needs kid (always has been, always will be) but things were drastically improved! With Owen I started the program earlier and it worked like a charm for him too. Pantley's methods got both Aiden AND Owen sleeping perfectly through the night. To this day I have ZERO problems with the boys going to bed. I am still using her methods with Olivia- both for bedtime AND naptime. Naptime is going beautifully well but I will admit bedtime is taking longer with Olivia but it IS working. And I am ok with it taking time. One of the pieces of advice in Pantley's book that I loved is this: " At any time if you feel too frustrated to continue with the [method] just let your little one nurse to sleep and try again at the next nap. Don't feel you must succeed quickly. This process may take some time. Be patient. There are no awards for being the first parent on your block to have your child fall asleep without your help!" I also LOVED this one " If you really love having your sleeping baby in your arms and your daily schedule allows this pleasure, then continue on as you are with my blessings. Don't change what works for you and your baby because someone else told you that you should. If your baby is having long, restful naps in your arms or sling and you are happy holding him, go ahead and enjoy this precious, fleeting time in your life and his. Don't change what works today for some fear of future problems. It will likely be no harder or easier for your baby to make a change now or later, but it will be easier for you when you are truly ready and motivated to create change." That right there is why it is taking longer with Olivia- she is my last baby and I am holding on to that pretty tightly :) I am not nearly as motivated to create change with her! Thanks to the Family Review Network for giving me the opportunity to review the No-Cry Nap Solution!